A Board Certified Massage Therapist & Bodyworker (BCMTB), Georgia Licensed Massage Therapist and Reiki Master, Trina Pinkney fell in love with Savannah while completing her undergraduate and graduate degrees at SCAD. Originally from Montgomery, Ala., Trina first came to Savannah in 1992 for her undergraduate degree in Video and Computer Art. After spending time in Atlanta at CNN Sports Illustrated, Savannah again called her south, this time for her Master’s degree in Video and Film. Her degrees took her north to ESPN in Bristol, Conn., where she continued to work her way up the media industry’s corporate ladder. But a car accident in 2006 changed the course of her life. While completing rehab for her injuries, Trina discovered a new interest and passion for healthcare, guiding her spiritually, physically, and mentally to a new calling. Her journey began with the study of Reiki (energy work) with a shaman, before moving to body work after volunteering with chemotherapy patients at Bristol Hospital. A patient suggested learning about massage therapy, and Trina found herself calling for information, then “the next thing I knew, I was in class. It happened fast, like I fell through a door,” she says. After graduating from massage school, Trina left Connecticut for Savannah again, this time with a new career and new goals. 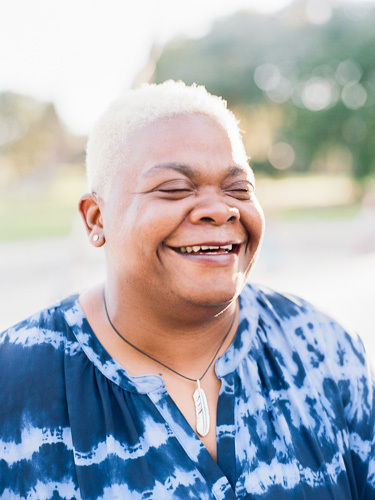 She established Balancing Touch, and started working with Hospice Savannah to provide patients with reiki and massage therapy for pain relief and comfort in transitioning. She’s since expanded her healthcare offerings to include Swedish massage, myofascial release, integrative massage, deep tissue massage, trigger point therapy, Reiki energy work, cupping massage, geriatric massage, oncology massage, pregnancy massage, hot/cold stone massage, and sound therapy. All therapies are tailored to the individual and their needs. Even after returning to Savannah and opening Balancing Touch, Trina continued her quest for new challenges. She began attending CrossFit SteadFast to improve her fitness, and in the process found a new love for strength training and powerlifting, increasing her confidence and strength (something her clients benefit from!). In her free time, Trina volunteers her skills at The Children’s Hospital at Memorial Health, Hospice Savannah’s Camp Aloha, JC Lewis Cancer and Research Pavilion, Anderson Cancer Institute, and competes in CrossFit and powerlifting competitions. You can follow her powerlifting career on Facebook. Trina is a Board Certified Massage Therapist & Bodyworker (BCMTB), Georgia Licensed Massage Therapist (MT006870) and a member of AMTA (American Massage Therapy Association), ISTA (International Sound Therapy Association) and IARP (International Association of Reiki Professionals).